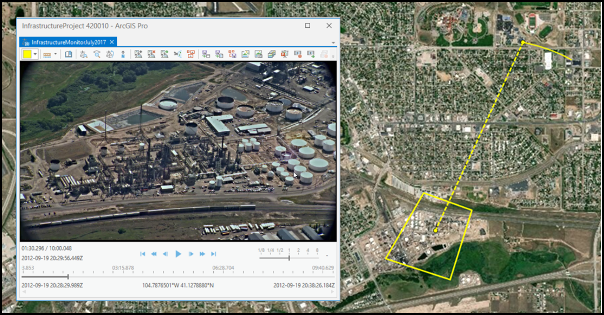 Full Motion Video (FMV) in ArcGIS Pro provides the capability to work with archived and live streaming video data using a video viewing and analysis system called the video player. With the video player, you can visually analyze video data imagery and collect features of interest. It works with video data that includes essential geopositional, sensor, and platform orientation information encoded into the video data stream that enables you to know where the video image is placed on a map. This unique capability gives the video important geographic context as you view and analyze the data. The video player experience is similar to the ArcGIS Pro map viewer and can be moved anywhere on your display, resized, minimized, and closed. The FMV-compliant video data contains camera-pointing information, platform position and attitude, and other data that is encoded into the video stream so that each video frame is associated with geopositional information. Display the video footprint, sensor location, and field of view on the map. Update the map to zoom to the video frame, or follow videos across the map. The video player display and map display are linked with a bidirectional image and map coordinate transformation. Thus, any information collected in the video player is projected and displayed on the map, together with your existing GIS data. Any number of videos can be opened and played at the same time. Each video, and its associated graphical information, is identified by a unique color when displayed on the map. Work with live streams and archived videos. 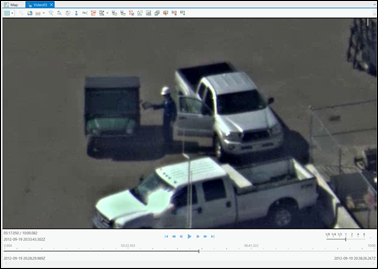 Use intuitive digital video recorder (DVR) controls, image and video clip capture, and analysis tools. Display metadata in real time as the video plays. Mark locations and phenomena of interest. Twelve video formats are supported in FMV. To play an archived video file, browse to the video file and add it to the Contents pane or the display. The video player will open with the video file loaded and will be docked below the map. The video player can be moved and placed anywhere on your display. It can be resized by grabbing and moving a corner or edge of the player. Choose a color to identify the video file and associated graphics—such as video footprint—on the map, and feature class data you want to collect on the video. Defining your workspace geodatabases and folders up front allows you to quickly export the different types of data extracted from your videos. Highlight a video in the Contents pane, select the Data tab on the main menu, and click the Configure Workspace button in the Manage group. Define your default geodatabase and folders to save exported metadata files, images, PowerPoint presentations, and video clips for your project. The default workspace settings for saving video data is your project geodatabase, with appropriate subdirectories automatically set up for the different types of exported data. To perform video data monitoring, you can quickly expand the video player to full screen mode by pressing the F11 key. If you do not have function keys, you can press Ctrl+Enter to expand the video player to full screen. The video player in full screen mode does not have a close button. To revert back to standard viewing mode, press F11 or Ctrl+Enter again. If multiple video players are open, the active player will be controlled by the keyboard shortcut keys. If multiple video players are open, only the active player will not have the close button; the other players will operate in standard mode. Plays the video according to the frames per second rate of the video. When the video is zoomed and playing, the video is played at the selected zoom level and position within the video frame. After clicking Play, the control changes to the Pause control while the video plays. The paused video is at the selected zoom level and position within the video frame. After clicking Pause, the control changes to the Play control while the video is paused. Steps the video forward by a number of seconds or frames defined in the FMV toolbar. Steps the video backward by a number of seconds or frames defined in the FMV toolbar. Fast-forwards the video based on the playback rate of the video player. The speed increments by a whole number each time Fast Forward is clicked. Playback speed is reset to 1x when the player is paused or stopped. Rewinds the video based on the playback rate of the video player. The speed increments by a whole number each time Rewind is clicked. Jumps to the end of the video. Jumps to the beginning of the video. While the video player is active and the pointer is located in the player, use the mouse wheel to zoom in and out of the video. When zoomed, the pointer changes from the default arrow to a hand. In the video player, click to grab the view and pan around in the video frame. When the video is zoomed, an outline of the video frame is displayed in the upper left corner of the player. Within the video frame outline is a graphic that represents the size and position of your zoomed view. Zoom and pan mode works when the video is playing in any mode, or paused. The size and position of the zoomed view persists as the video plays. The video playback slider handle indicates the relative location within the video timeline being displayed in the video player. The video playback slider handle can be grabbed with a left click and moved along the playback slider. The location within the video is indicated in both the coordinated universal time (UTC) time stamp on the lower left of the DVR controls and, above it, the time stamp of the video frame within the video file. The map coordinate of the video frame is indicated on the lower right of the DVR controls. You can adjust the playback rate of the video with the Fast Forward and Rewind DVR controls. The playback rate is indicated to the right of the DVR controls. The playback rate reflects whole numbers. Click the Pause button to stop the video. The playback rate is reset to 1x. You can adjust the playback rate with the fine-tune slider. The playback fine-tune slider allows fine-grained control over playback speed. The playback rate is a fractional number based on the slider position. The resolution is .01 second. The playback speed ranges from 0.01x to 3x play speed. This means that you can play a video in slow motion when playing at speeds less than 1x. The tick in the middle of the control is 1x speed, or normal playback speed. The slow motion playback rate is reset to 1x whenever any of the time slider or standard DVR controls are used. Information about each video frame is displayed in the video player in real time as the archived video is played. The UTC UNIX time stamp in human-readable format is displayed as the video plays. This time stamp reflects the position of the video slider along the video file timeline. Click the clock icon to show all the features whose time stamp matches the current video time stamp. The feature layer must be time enabled and loaded in the Contents pane and active in the map. This allows you to query features from time-aware layers both spatially and temporally for features intersecting with the video footprint and displayed in the video player. The time stamp of the video position slider handle along the video file timeline is displayed in the video player. The format is days, hours, minutes, and seconds. Display the map coordinates of the center of the video frame as the video plays. The map coordinates displayed in the video player are the same as the Map's spatial reference system. Place the pointer on the coordinate display to highlight it, then click to Zoom to frame center on the map. In addition to the DVR controls, important and useful FMV functionality is accessed from tools on the video player. 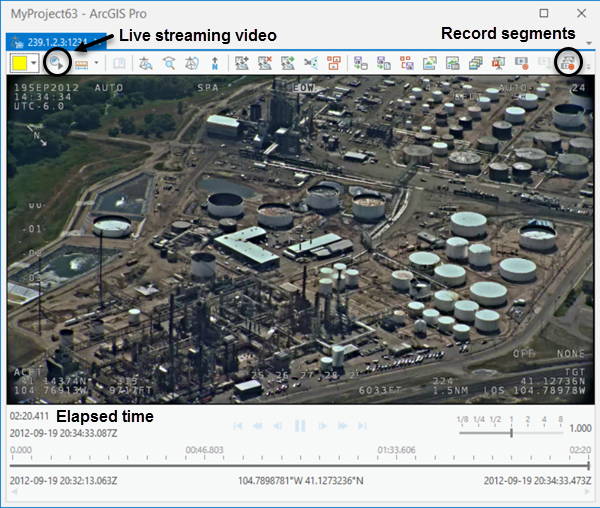 These tools support common video analysis and management operations and workflows. The following table lists the tools on the video player. Zoom to the map location of the video. The view within the map display includes the video frame, as well as the ground track of the imaging platform. Zoom to the map location of the video’s current frame. Collect a new bookmark. A dialog box appears and allows you to enter a bookmark name and description. Continuously center the map display on the video frame and ground track of the sensor as it plays. The map display will pan as the video reaches the edge of the display. To stop following the video, press the Follow Video button again. Save platform, frame center, and frame outline metadata as a feature class to the project's geodatabase, unless you reconfigure it in the Configure Workspace settings. Capture a video frame as an image each time the button is clicked. The image is saved in JPG format in the default directory. Save video frames as images in a directory or in the project geodatabase. Save platform, frame center, and frame outline metadata in a comma-separated values (CSV) file. Export a segment of the video to the directory of choice. See details below. Export video content to a PowerPoint presentation. Add points in the video player display or on the map. The points will be displayed in both the player and the map, and will be displayed in the color identifying the video. Remove marks from the video and the map. Save marks to a point feature class. A dialog box opens and allows you to browse to and select the geodatabase, and name the feature class file. Display features from the map on the video. Video bookmarks can be collected in the different modes of playing a video, such as play, pause, fast-forward, and rewind. Bookmarks are associated with a time stamp from the active video, and can be spatial (2D or 3D) or temporal in the map. A time-enabled map means that spatial bookmarks can be created for a specific point in time. A bookmark is collected each time you click the New Bookmark tool. As you collect bookmarks, they are saved in a list and are available with the video and all maps in the project. To help differentiate between your bookmarks, they are captured with a thumbnail map snapshot with a small camera in the lower left of the thumbnail. Bookmarks are described in the Bookmark pane that appears when you collect a video bookmark. Bookmarks are collected and managed in the Bookmarks pane available on the ArcGIS Pro Map tab, in the Navigate group. Bookmarks are saved in the project. Click the Metadata to Features tool to save video metadata as a feature class in a geodatabase. A dialog box appears for you to specify a geodatabase and capture frequency as an interval of video frames or seconds. You can also choose to display the features on the map as they are created. The geodatabase is continuously updated while the video plays until you click the Metadata to Features tool again to disable it. The sensor ground location is stored as a point feature class with the video file name appended with Camera. The video frame center is stored as a point feature class with the video file name appended with Center. The video frame outline metadata is stored as a polygon feature class with the video file name appended with Outline. Click the Frame Snapshot tool to save the current video frame as an image. The image is saved in .jpg format in the project's geodatabase in the Images directory (default), or choose a different geodatabase. The image is also loaded in the Contents pane and map display. Use the Frames to Images tool to capture video frames at an interval and save them as images. When you press the Frames to Images tool, a dialog box appears for you to specify an output directory and file type. You can save video frames as NITF, JPEG or PNG image file types. The dialog box also allows you to specify an image capture frequency, either every nth video frame (the default), or every nth number of seconds. Check the Add the layers to map check box to load the captured images into the map. When you close the dialog box after specifying the output directory, the frame capture begins. Click the tool again to stop video frame capture. The captured video frame images are given a unique name based on the frame's time stamp. The metadata associated with the video frame is also saved with the image file. Click the Metadata to CSV tool to save video metadata to a comma-separated values (CSV) file. A dialog box appears allowing you to save the CSV to the project's geodatabase, or save it to a separate directory. The CSV file will contain all the MISB metadata encoded into the video stream. Click the tool again to stop the recording of the video metadata to a CSV file. Interactively define the start and end of the segment of the video you want to clip and export. Click the handle that is at the beginning of the time slider and move it to the point in the video when you want to begin the export. Click the handle at the end of the time slider and move it where you want to end the clip. See the video playback during manual adjustment of each handle. The time stamp indicates the position within the video of the beginning or end clip handle on the slider. To return the handles to their original position, double-click one of the handles. Alternatively, you can drag both handles to the beginning and end of the original video. Click the Export Video Clip tool . A file navigation dialog box appears for you to specify the directory and file name. Choose any of 12 supported video file types. The portion of the video between the two handles will be saved in a separate file. Export video content to a PowerPoint presentation. Exported content can include the current frame; full extent of the frame outline; and full extent of the frame center, frame outline, and sensor platform. While a video is playing or paused, click the Export to PowerPoint tool . The first time you click the Export to PowerPoint tool for a particular video, the Select PowerPoint Presentation dialog box appears listing open PowerPoint presentations for you to select to append the new content. If no PowerPoint presentations are open, you can navigate to a stored PowerPoint presentation, or specify a new file. Video data will not be exported to the PowerPoint presentation until the PowerPoint application is open and active on your desktop. Export all video frame slides to the selected presentation. This is the default. Add slide for map view of frame center, frame outline, and platform. Add slide for current map view. With PowerPoint open and active, click the Export to PowerPoint tool to create the slides you specified in the Select PowerPoint Presentation dialog box. Each time you click the Export to PowerPoint tool, the new content will be appended to any existing content in your presentation. Metadata pertaining to the video frame is also exported to the PowerPoint presentation in the Notes section. This includes the source video name and file location, and all FMV and MISB metadata associated with the video frame. 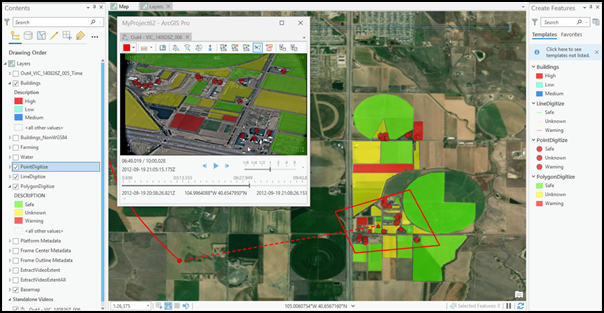 The Add Graphics tool allows you to digitize a point on the map within the video footprint, and displays the point on the video. It also allows you to digitize a point on the video and see the points displayed on the map. If you have several videos, the tool will detect each video's footprint and add points to each video. The created points are temporary. Click the Save Graphics tool to save the points as a feature class in the project's geodatabase. The points will remain visible on the map—and in the video player if the footprint contains the points—until you click the Remove Graphics tool. Feature classes loaded into the Contents pane and displayed on the map can also be displayed on the video in the various play modes. Click on the Sync Graphic tool to display and link features in both the video player and the map. Features can be created or edited on the map or the video player, and the results are displayed in either viewer. The feature creation and editing experience is consistent with ArcGIS Pro. See Introduction to creating 2D and 3D features and Introduction to modifying features for more details. To play a live video stream, you will need either the User Datagram Protocol (UDP) or Real Time Streaming Protocol (RTSP) address of the video stream. The Full Motion Video player supports Internet Protocol version 4 (IPv4) addresses and both the UDP and the RTSP. MPEG TS streams can be broadcast as UDP unicast or multicast and can include MPEG-1, MPEG-2, and H.264 video decoding, and KLV metadata parsing. RTSP playback is supported for live RTSP streams that use any of the following video codecs: MPEG-1 Video, MPEG-2 Video, H.264, and MJPEG. When you have verified that your broadband connection is operating, add a live stream video to the map display from the Map tab on the main ribbon, click the Add Data drop-down menu, then click Data from Path, which opens the Add Data From Path dialog box launcher, where you enter the UDP or RTSP address of the video stream and click Add. The live stream video is loaded into the video player and begins to play. The Elapsed time of the live stream is displayed as the video plays. The video player controls are not enabled in live stream mode. All the video player tools are enabled except for New Bookmark and Export a video clip, and operate the same as with an archived video file. An additional tool is available in the video player, Review video stream (UDP only) . 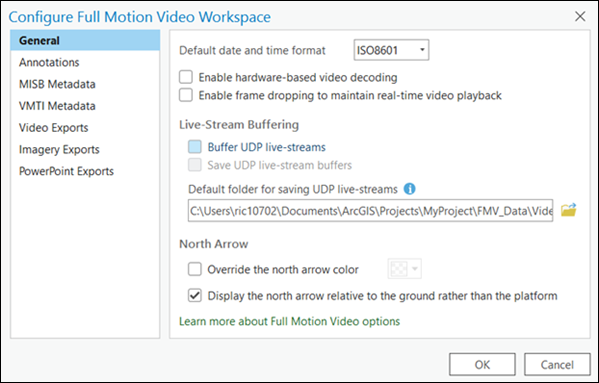 The Review video stream (UDP only) tool allows you to review the previous 90 seconds of the live stream by enabling some of the video controls similar to an archived video file. When the Review video stream (UDP only) tool is activated, the enabled video controls include Pause, Rewind, and Go to the beginning, which takes you to the beginning of the 90-second segment of the live streaming video. The Elapsed time indicator shows the elapsed time of the video as it plays within the 90-second segment. Click the Review video stream (UDP only) tool again to deactivate it. The live stream video will resume playing, and the Elapsed time indicator will display the current time since the live stream video was initiated.